Are you dreaming of flying but afraid of heights? The StreetFlyer is a vehicle that gives you the free, soaring feeling of flying but without the danger of plummeting to the ground. It was invented by Dr. Carsten Mehring, who says that the design incorporates movements of swimming, running and flying. 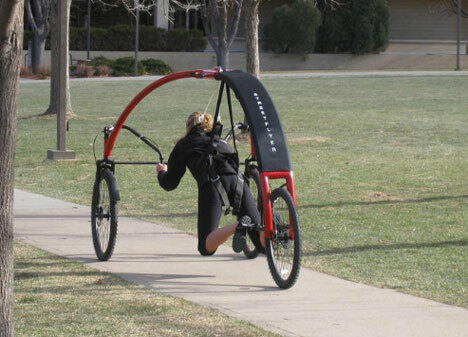 The lightweight frame includes a harness which suspends the rider in a horizontal, Superman-type flying position, then glides along on a hard surface with the power of momentum. The StreetFlyer isn’t motorized, so the rider must run to start it moving. The steering mechanism works in a similar way to a bicycle, allowing users to steer the device in a familiar and simple way. When rolling along, the user looks like a hang glider suspended above the pavement. With brakes but no propulsion system, the device could even be used for zero-impact rehabilitation exercise. 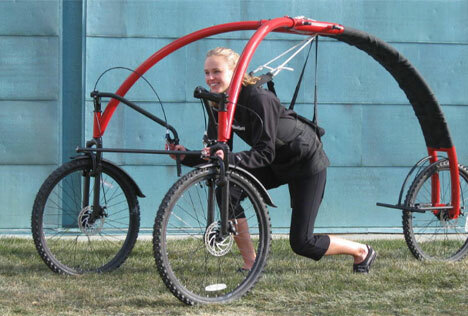 There are two versions of the StreetFlyer: this one, with a stable lightweight frame, and a different prototype with a retractable frame that is worn on the back until the user wants to start “flying.” For adventure-seeking outdoorsy types, this could just be the next big craze. See more in Bikes & Cycles or under Transportation. February, 2011.